A fantastic DVD game designed to build business in bars and other retail outlets. Pick A Box is very easy to use - simply load the DVD, select one of the 12 boxes and press play. It's that easy! Boxes are 'reshuffled' after every turn so there is always a one in twelve chance of winning. 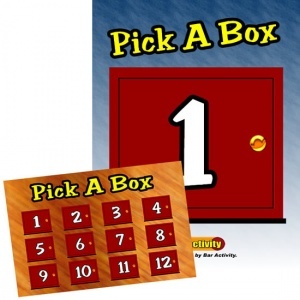 Pick A Box is perfect for outlets that require a simple, cost effective instant win promotion. Use at point of sale and award winning customers a discount. Alternatively, offer a prize and drive sales, promote brands or increase footfall during specific trading times. The kit includes the DVD game and 3 x A3 colour posters.